Chen Quanguo, Communist Party of China (CPC) chief of Tibet. (TibetanReview.net, Feb20, 2015) – Ushering in the Tibetan New Year, or Losar, on Feb 19, which also happened to be the Chinese Spring Festival day, China’s official Xinhua news agency said Feb 18 that Tibet will mark crucial anniversaries during the coming year. It added that the government will be alert to any threat to stability there. It said that in September, China will observe the 50th anniversary of the founding of Tibet Autonomous Region. The anniversary actually falls on, and used to be marked, on Sep 9; but after China’s great Helmsman Mao Zedong died that day in 1976, the anniversary was shifted to Sep 1. This year also marks the 30th anniversary of China sending the first group of Tibetan students to study in inland cities, to boost the development of the landlocked Himalayan region, the report said. Critics allege, however, that China’s real objective is to bring up the more intelligent of Tibetan children under Chinese culture in a Chinese social environment for the long term objective of Sinicizing the Tibetan Plateau. The report said that Tibet, still one of the poorest regions in the world’s second largest economy, will aim to maintain economic growth at 12 percent, the same as last year. The aim, it said, was to fulfil China’s goal of building a well-off society by 2020. The report also said that this year the Dalai Lama will turn 80, “an occasion which has already been used by the political exile as an opportunity to preach the de facto independence of Tibet”. It criticized the exiled spiritual leader of Tibet for his Dec 2014 remarks that “his traditional religious role should cease with his death”, claiming this was against the Tibetan Buddhism tradition. Atheist China which bans the members of its sole ruling party from being religious insists it has the right to determine the reincarnations of Tibetan spiritual leaders, including that of the Dalai Lama. 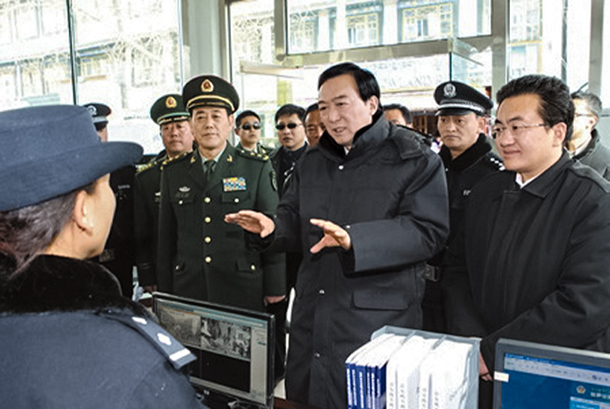 The report said that during the week, Chen Quanguo, Communist Party of China (CPC) chief of Tibet, had urged the region’s officials to stay alert for anything that could threaten stability. “Maintaining stability is still a challenge for Tibet […] stability supersedes all,” he was quoted as having told a regional work conference. The report also referred to the fact that in the first weeks of this year, tension and confrontation had already emerged between Beijing and the West over Tibet. It said US President Barack Obama warmly acknowledged the Dalai Lama in Washington despite Beijing’s protests.